The weather has been unusually warm around here. All this warm weather is making me really impatient for spring and summer to get down and dirty in my garden. So here is a dose of flower power for you guys, the most beautiful thing from my garden last year. As a kid my mom always used to tell stories about her childhood home. The home they lived in had 3 ponds, ya 3! Back in those days people in Kerala had to rely on their own water supply. Every house in that area had ponds instead of wells. Back to the story…3 ponds; 1 for drinking and cooking, 1 for bathing and swimming, and 1 for washing the dishes. Isn’t that super cool? Ever since, I have admired homes with water gardens and wanted to live in one with at least a pond (yet to happen). Finally when we moved to the new house, I was all set to put in a pond. A pond in an itsy bitsy backyard? Not very practical. Time to reevaluate priorities; after pondering quite a bit on why I need a pond the answer was surprisingly simple. I wanted to grow water lilies and lotuses. A water garden! That’s what I wanted not a pond! On to Google; after some thorough research and a couple of trips to Lowe’s and Big Lots I had my own piece of water lily action. Pick a sunny spot. Tropical plants love sun. Decide on your container. A medium to large size will be better. Mine was a plastic wine barrel planter. Select your plants. To add interest, use plants with different visual heights. Use marginals like canna lilies, dwarf papyrus, taro for height. The water lilies or lotuses of course. Their leaves will cover much of the water surface from sunlight preventing algae growth. Don’t forget the floaters; water hyacinth, water lettuce. Absolutely love the latter but couldn’t get it to grow big in mine. May be the spot as too sunny. You could add cascading plants like water mint too that would fall over the container’s edge. I didn’t add it to mine as I felt that my container was already getting pretty crowded. A water pump kit to keep the water moving and to stop mosquitoes breeding in your lil water heaven. You need the pond water pump variety, which are expensive. I tried using an aquarium pump, didn’t work :(. Next option was to use mosquito dunk. Looked like it was working. They say it is perfectly safe for everyone including fish but my kids always put their hands in the water. So wanted something natural and went with fishes,$0.25 cent mollies from Walmart. Worked like a charm. Plant your marginals and lilies in pots that will fit into the container. You can add some height to your lilies by placing the pots on rocks. I used the throwaway pots that you get when you buy plants from stores. Already had them in the garage ( I never throw these away not sure why) and no one was going to see it under the water. You need real potting/garden soil for this stuff not the peat mossy kind. Or else the soil will just float on the water. I skimped on buying aquatic fertilizer and just added in some Miracle-Gro to my soil. Add some rocks as the top layer in your pots. Again to stop the soil from floating to the top. I just picked up some small stones from the yard. Arrange the pots in the container. Add water, your floaters, and your mosquito dunk. If you are adding fish, wait for 2-3 days so that the chlorine in the water settles down/ evaporates. You are good to go! Wait patiently for your plants to fill out. I think since I skimped on fertilizer and didn’t start the project until July I had to wait for 2 months for the first Lilly to appear. The Cannas started blooming early though. The only good thing about waiting till July to start the water garden was that all the plants were on clearance and I got them dirt cheap. All in all, the Cannas bloomed 3-4 times and lilies thrice in the two months of the growing season. We had 3 mollies Speedy, Grace, and Shine and tons of fry in there. Update: I was really lazy about winterizing the whole thing and we had an unusually cold fall, even snow in October! Sadly all the fish died before I could get to them. Since then I have emptied out the container and stored the plants in the garage. Again not the right way. Should have taken the bulbs/ roots out of the pot and stored it in a brown bag. I just stuck the whole pot in my garage. Keeping my fingers crossed for spring. Hopefully will see some signs of growth! Maintenance: 3 mollies and tons of fry can poop like crazy. So had to change the water may be once in 10 days. It would get pretty murky by then. No high-fi methods here, just make sure to pour 1/3rd of the old water back into the pond so the fish do not get water change shock ( is that even a word?). Feed the fish once in 2 days. The algae was not at all a problem once I had the fish in. If you are using only the mosquito dunk then you will have to clean the container every time you change the water too. Lesson learnt : I think if I had fertilized more aggressively then I would have gotten more flowers. Have to sneak in one more shot of my pretty water lily! What do you guys thinks? Isn’t seeing these beauties on your porch/deck worth the effort? Here is an update of this year’s water garden. Thanks Shiloh for dropping by and taking the time to comment. You should try it too. Are starts available of your yellow cannas? I have a similar aquatic variety in hot pink if you would like to trade. Thanks. Do I take the starts out when I winterize them in fall? How do I do it? Vidya, This is awesome. How do I go about this in India?? I never thought I could do something like this on my tiny balcony garden. Do you want to do a more detailed post – step-by-step of how you set that pot up and stuff. I was going all giddy in the head just looking at the lotus in that container. AWESOME ..Love it. Thanks Sunita. That is pretty simple. I just potted the plants into small pots and dropped them into the large pot. That is all. It is really very easy and you can do this all yr around(that’s the best part) in India. Here the growing season is so short. And if you have fish in there you don’t have to worry about the mosquitoes. Vidya, love it!!! Actually, one of our friends has a little man made pond(part of her landscaping), she also has some water lilies & water plants and some fish in there as well..when I saw that I was so carried away that I told her when I buy a house some day, I want to have one in my backyard too..I hope she doesn’t remind me now ;)- actually I hope to try to do it this spring or summer..we’ll see…& I’ll get some info for you on that, if you’d like. Ya definitely give it a try Preetha. Glad you liked it. No I didn’t use a pump. Let me know how it goes. Love this idea! My mom had three kio ponds going up and I always wanted to have one of my own. I wanted to make sure I read right, you said that you used fish instead of a pump and just cleaned it once every 10 days? Thanks Sara. Yes, I did not use a pump. Just had 3 small fish in there and changed the water once every 10 days or so. If you see that the fish are making the water murky faster then you might have to clean it more frequently. Next time I might add only 2 mollies, they breed pretty fast. I think you have a great idea here except the type of fish. The gold fish from any store for 25cents would be better considering mollies like the water warm, brackish and well filtered. Thanks Lisa. Will try it this time around. I’ve had gold fish in a small tank and have foudn that you need to stay on top of keeping the water clean. I was dismayed you were not able to “get to the fish on time”. However on a more positive note, you can purchase a small pump at an ACE for about $20 that I use year after year in my small pond. This past summer I had three going. great idea! This may be a silly question, but how did you change the water? Thanks Cindy. I changed the water the old fashioned way. The container was on my deck so I would just spill it over carefully. You could also do a thorough cleaning when you change the water ( might have down it twice the whole season). First transfer a third of the water into a bucket and save it for the fish. Now spill the rest carefully. Can use a pail or a big bowl instead. Whenever I used a bowl I would just pour the water on the other potted plants on the deck. Take the water plants out if it is easier for you. When you are close to the bottom scoop out the fish with a fish net. Give the container a good scrub and put the plants, saved water, and the fish back in. Use a hose to fill up the container. Hope that helps. I love this idea! I’m wondering if it’s possible to put a filter in so I wouldn’t have to clean it as often. What made you decide not to use a filter? Also, you don’t use the mosquito dunks if you have fish or do you use them anyway? Thanks Karen. Glad you liked it. I think you could use a filter. I was not very comfortable leaving something electric (another reason I was vary of using the pump) plugged in all the time, especially with my kids around. Even though they are 8 and 6, water is still a big attraction. No, I did not use mosquito dunks once I put in the fish. You do not need to. It is either the dunks or the fish, unless you live in the tropics? We have a lot of mosquitoes/insects here in VA during the summer, was not an issue. Wow! Thanks for sharing your project. If we were to add a pump and filter do you think we would need to change the water so often? We have a large property to maintain and I fear we would be really bad about the 10 day maintenance. Thanks again!!! If you add a pump and filter then you wouldn’t need to change the water so often. Do let me know how it goes. This is great. I just went to Home Depot and local pond store today and did it myself thanks to your post. 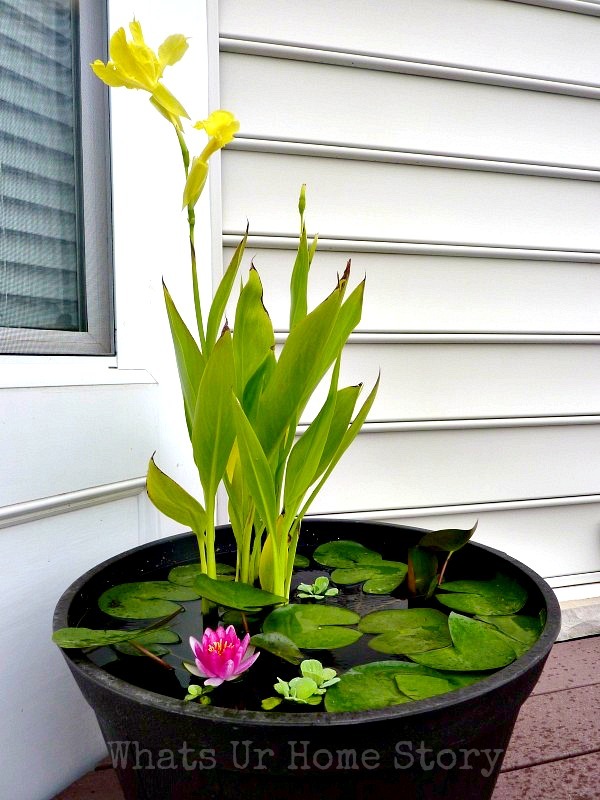 Only thing is, the pond guy told me the lily would be too big for my pot. The plants he had were very large. What kind did you get? I have three nice bog plants though, and am hoping to get some water mint when it comes back in. Would like to add a lily as well. When did you add fish? The pond guy told me 45 days. I have to say, we are blessed with a 2 acre pond coming on to our property. First thing I got was ducks! Second thing I got was water lilies. In a game of rock, paper, scissors; Ducks beat & eat lilies. So I was thinking of something like this on the deck so I could enjoy them. If you have a chance, a few years ago on my blog, I bought some water lily seeds and grew them just to see if I could. Of course it died as soon as I moved the milk jugs I did them in outside to harden off. But it was quite interesting! We grow cannas all over here just fine. I never take them out of the ground so you should be able to over winter them right in the container. Tough as nails those cannas are! I may break and get a tiny pond filter for ours, I have seen them on craigslist. Apparently people get sick of the maintenance and I’ll take advantage. A 2 acre pond! I’m so totally jealous! Wow. I would have also got ducks first, I just love them. My cannas haven’t been doing as well as I want them to be for the last 2 yrs. May be I should stop buying form Home Depot and get it from a nursery. 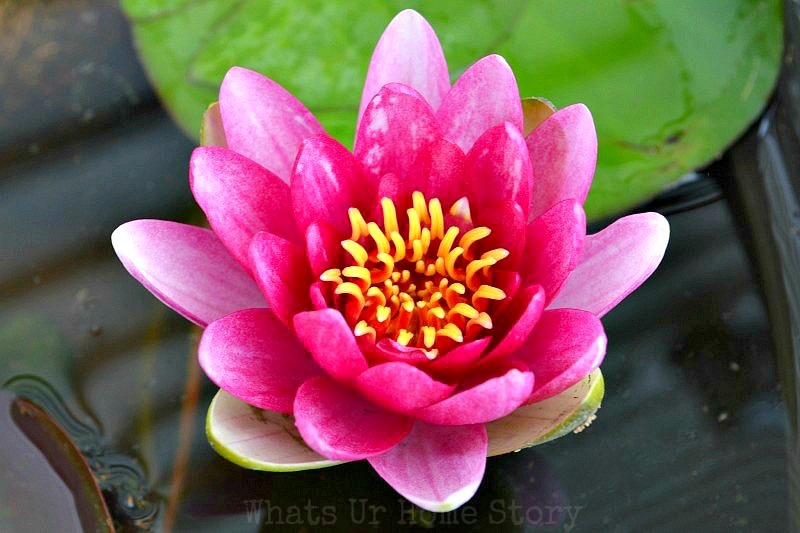 Have you looked at adding lotus instead of the lily, they are usually more vigorous? So ducks might not be able to do much harm. Do let me know how it goes. Wow Vidya creativity is your gift .I really love ur works. Thanks so much Viji. Glad you liked it. Awesome Vidya! planned of doing this last summer,but was not sure how it would turn, but u r project has inspired me again will definitely try this summer…..
You should definitely try it. It is so worth it! This is such a beautiful idea! I’ve always wanted a pond in my yard, but this is so much simpler. Thank you for sharing! Thanks Brandi. Should try it. It is really easy. This is a wonderful blog; I really love it! Your water garden is so pretty. I’m moving into a house next month (cannot wait to escape this awful apartment!) and this will be one of my projects for sure! Thank you for sharing! Thanks so much Annalisa. I can’t wait to put it together again this yr. Luckily one of the water lilies and the cannas survived the winter even though I didn’t do anything to protect them. I’ve already planted some elephant years for this time. The weather around here has been so erratic to set it out on the deck. Do let me know how it goes. Hi, I love the look! It is what I have been wanting but wasn’t sure what plants to get. Are the Cannas special “water flowers” or just normal Cannas bulbs? If normal, do they get mushy when in water for the season or do they survive for next year? I am bookmarking you!! LOL. Thank you. These are just the regular cannas. I bought a pack with 5 bulbs in a pack from Walmart and planted two in the water garden pot and 3 in a regular one. Strangely none of the plants (they were not as big either) in the regular pot flowered. In the winter, you are actually supposed to dig out the bulbs/tubers and store them in brown paper bag in a cool place (basement/garage). I got lazy and just took the pot out of the water garden and left it under our deck. Now they are sprouting back. I guess I have to thank the mild winter for that. Even the water lily (only one, the other died) survived without any care other than keeping the pot in the garage. Let me know how it goes. My bad…..I was going through my old plant cards this evening and it looks like these are aquatic cannas. I think even the regular ones should work as we used have cannas growing in boggy areas in my grandparent’s property. I got those from Lowes. Thanks Vidya! I will look for them. I have had some luck with Cannas but I usually forget to put them in the ground or lift them for the winter! I bought the container last year on clearance, so as soon as the nurseries get the water plants in Im ready to roll! I will let you know how it turns out. Do let me know. Check out your local nurseries too. I was at our local nursery last week and they already had the water plants out. Voila is right! I am totally pinning it, great instructions and awesome result!! Thank you so much for linking this up to our party. Thanks for stopping by. Glad I discovered your blog. Loved your foyer redo. The party too features some awesome ideas. This is amazing! Now I want a water garden – you make it seem so easy (even I could do it)! So glad you joined our party! Thanks a lot for dropping by and pinning this. Love your blog. Aww…Brought tears to my eyes. Thanks Teresa for the nice words. I’m so glad I could be of some help. Please do let me know how it goes. I realy like a concept o the a water garden because my backyard it’s so small. Thanks LC. Do let me know how it goes if you give it a try. I’d do a water garden but there are too many dang mosquito’s out – especially right now! I do like your planter though and I have this linked to my planters post too today, nice job! Aww…sad to hear about the mosquitoes. Have you tried fish in the water garden? I don’t even use dunks now that I have the fish. Thanks for the feature. Heading over to read the rest of your blog. Thanks for the awesome post and inspiration! I want to find a pot like yours but it’s not easy. Do you know the gallons or dimensions of yours? Also, what is it made out of? Thank you Charmaine. Yes it depends on where you live. If you have cold winters then you have to wait till late spring/early summer to start. The pot is 20″ in diameter on the top and a little less on the bottom and is made of heavy plastic. It is a plastic 1/2 whiskey barrel kinda thing. Hope that helps. Do let me know how your search goes. By leaving fish poop in the water you are fertilizing your plants naturally. Don’t change the water out and your plants (and probably fish) will do much better. The stress of having that much of their water changed so frequently, and no de-chlorinated couldn’t have been good for them. This idea just made me giddy…but I am wondering if it’s a possibility here in Phoenix during the summer…afraid I might cook the plants and fish:O Any ideas on how they might do and if its even possible. Thanks and love your blog! Thanks Tami. I think it could work. My mom lives in the tropics and it can get really hot there too and she has something similar. I would double check with your local nurseries before actually starting the project. I will definately check ’cause when I say hot…I mean desert hot:) Hopefully I can get it to work, can’t wait to try! How big is the pot you used?? It is 20 inches across (diameter) on the top. Yes I do. The water turns really murky as the algae builds up around the 2 week mark. Some one suggested changing out only a third (if you have fishes) of the water. Got to try that this yr.
Be sure to use the ‘old’ water from your water feature to water your other potted deck plants – they love the ‘fish water’ and its great fertilizer. That’s a great tip Leta. My deck plants and hydrangeas always get the old water. If you don’t want to put fish in it then to prevent mosquitoes from breeding you need to use either mosquito dunk or a water fountain to keep the water moving. Stagnant water = mosquito breeding ground. Also there will be algae growth without any fish. So you would need to clean it very often. For me this year, it has been almost 2.5 months now since I set it up. I might have changed the water twice maybe? I just add more water into the container to make up for what is lost in evaporation. I’ve 2 mollies in there and they seem to be thriving. Have so many babies too. I hardly feed them. They seem to be doing all the algae clean up. The water is clear and not at all smelly. Hope that helps. Good luck with yours. Do let me know how it goes. Thanks for the quick reply. I will definitely let you know how it goes maybe send a picture or two. I have heard from the local nursery that bone meal is really good. So you were right about the mosquito larvae and so I got 6 guppies and put them in the pot last night. Five of them jumped out of the pot and died and I cant find the sixth. Now I noticed that most of the larvae were not there or they became mosquitoes already. Aquarium guys suggest putting a top over it but that wont do for the lilies. So…. I’m wondering what to do! Do I get more fish? Is there something I can get that doesn’t jump? You said Mollies, are they like the black Mollie? I can get that- DO they jump? Aww…that’s frustrating. Did you fill up the container to the brim? I always leave about two inches on the top and never had any problem with the fish jumping out. Apparently mollies are masters of jumping out of tanks! Hmph… maybe I’ll send you a pic… the larve are still there… something like a snail is also there! I donno where that came from! Where do you live? Depending on how hot it is you could try other fish. Hi, I’m just wondering how you plugged up the hole in your pot? It doesn’t have a hole. It is just your average plastic half barrel tub. I thought it would be more expensive. Do you have to anything special when it gets really cold outside? In Fall you have empty the container, store the lily bulb like you would any bulbs that you winterize in a cool dry paper bag in the garage. This year I moved my papyrus inside and it seems to be doing fine. IM looking forward to trying this. I have purchased a laguna tub…and a SOLAR fountian….very small one….I have a feeder goldfish that has survived “feedings” at the pet store and is now about 6inches that will be moving into the pond. I have to purchase lillys and some water plants…but IM on this! So adorable!!!! Yay! Sounds like a plan. Do send in the pictures Sherrie. A couple years ago we moved from a house with a huge yard and koi pond to a condo with only a lanai. This may be my solution to having a water feature again! Thanks. Yes, Gerr. This would be the perfect solution. I’ve had it for the past 3 summers and can assure you it is not a lot of work. Good luck! This year, I’m going to stick with simple Walmart mollies, mosquito dunks and my old fountain. I’ll get water lilies from home depot, not from Walmart. Hopefully, by June, I’ll post some pictures. This was my water garden from 2011. For the last 3 years I’ve been enjoying it on my deck every summer. In 2012 I tried guppies, didn’t work. Mollies seems to the best at thriving under pressure. Last year I could even go 3-4 weeks without changing out the water. I would just keep adding more water as it evaporated. Hope it works for you. This year I’m gonna see if I can grow a lotus. And do send in the pics. Would love to see your take on it. To winterize, drain the water and let the plant pots dry out slightly. After a day or two pull out the lily tuber, clean and let it dry. Once you’ve made sure that it dry store in a brown paper bag in a cool dark place like a garage or unfinished basement. Interesting but, I am wondering about the soil? I have a friend has done this on a larger scale (using an old row boat) she has absolutely no soil in hers. How/what did you do with the water feature during the winter. We don’t have really hard winters where I live but it will be below freezing 2-3 weeks in the winter. In October I empty the container, let the pots dry and store in the garage. The last 2 years the lily came back in spring but this year maybe çoz we had a harsh winter it died. Ideally in Fall you would take the tuber out and store it a brown paper bag in an unfinished basement or garage like an annual bulb that you would over winter. I’m just too lazy. I had my water garden built this year and love it. My cousin built up a 3 ft high waterfall that flows down a 2 ft mid-section then dumps into a 35 gallon pond. Used a bunch of large rocks from our property and put them around the pond. Just planted 4 waterlilies and added a few goldfish. You can use a algae treatment solution ( 1/2 tsp. per 50 gallon) and add a few barley pellets to keep the water clear. The birds love going in for a drink or a bath/shower. Also bought a 18 gallon oblong tub, so need to start shopping for more water plants/flowers. We spend hours just watching the waterfall and fish. That’s really pretty! I don’t think it’s a good place for fish, though. Goldfish are too messy and get too big, and tropical fish shouldn’t be kept outside in most parts of the US. And even if you find the right fish, you have to do water testing and so forth. I would suggest using a little nitrogen fertilizer to keep your plants fed instead of fish poop – or if you want fish, keep them inside, and use the dirty water you take out of their tank during their water changes to feed your plants! How do you handle this garden in the winter? Do you move it indoors? Never really thought to do something like this. You need to dump the water out, dry the tuber, and store it in a brown paper bag in a cool dark spot like basement. Replant in Spring. It told me something I did not know before. What kind of fish did you have? And where did you find the pump? Such a cool idea!! Wow! The end result is really beautiful. What a fun and creative idea. Thanks for sharing! If you get the fish do you still need the mosquito dunks? You don’t have to. I use both to be on the safer side. Sure Judy. I found it in the aquatic section in Lowes. Had thinner leaves than the usually canna variety. Hope that helps. Looks awesome…gonna do this this sSpring….my only question is…did you need a pump or not? No I did not use a pump. Good luck! Add a couple Guppies and skip the mosquito dunks. With the fish you don’t have to change the water that much. Maybe once in two weeks depending on how hot it is. Without the wish you do have to change it more often as there will be algae. Good luck with your water garden! Thanks for your swift reply 🙂 any specific fish? I was thinking also to put a water pump inside and make a small water movement to keep the water going round what would also extend the water life 😉 or is this wrong thinking? I’ve had success with guppies. Good luck with your water garden. I have a sandbox sitting around my yard for the past 3 years, and I was wondering how to re-purpose it when I stumbled across your blog. We don’t have any water features in our backyard, so I would love to start a water garden in the sandbox. My only apprehension is that the sandbox is just 10-11″ deep. Would that work for the pond? What aquatic plants work best with that depth? It is a bit shallow but I would say try the floaters like water lettuce. I have been wanting a pond/waterfall all my life. I have the pond container and got a “Waterfall” kit online real cheap. ( kit was reg $249.00/ paid $49.00). I am looking for ideas on combining the two. I plan to put it on the ground next to the deck so we can see and hear it. My main purpose is to provide a water supply for the wildlife here. Silver Gray Squirrels, Fox, Birds, Deer, Elk, Bunnies and lots of birds. There are lots of rocks here that I can use to build up around it. Still looking for ideas to make it really nice but practical. Wow that sounds great Carol. Would be nice to hear the sounds of water. Would love to see after pics. Carol, that sounds awesome. Similar thing to what I have been wanting to do. Would you mind sharing where on-line you got the waterfall “kit”? Thanks.